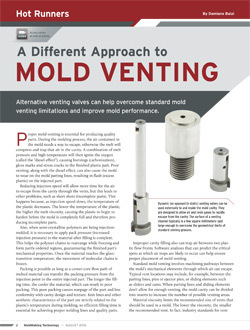 The dynamic SGD mold venting valve is an innovative solution able to help resolve the most common effects of poor cavity venting. SGD is based on a simple mechanical system allowing the gas to escape from a venting hole that automatically closes under the pressure of the plastic flow front. SGD can be placed inside the cavity where the filling pattern produces gas traps. The venting hole isn't affected by mold deposits, thanks to the high venting capacity counter pressure of the air inside the cavity is dramatically reduced.